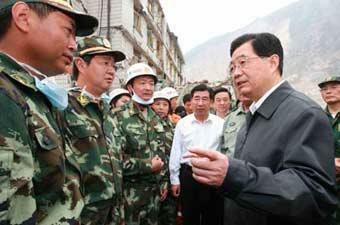 CHENGDU, May 17 (Xinhua) -- Chinese President Hu Jintao on Saturday urged rescue teams to reach remote villages that were battered by the strong earthquake in the southwestern Sichuan Province as soon as possible. Touring Wenchuan County, epicenter of Monday's 7.8-magnitude quake, Hu arrived at Xuankou, one of the three most severely damaged towns in the county, on Saturday morning. He said professional rescue teams and life detection equipment should be immediately sent to where people were buried. The situation in many villages were still unclear and he urged rescue teams to reach them on foot if necessary to rescue the injured and help in the relief effort. southwest China's Sichuan Province, May 17, 2008. He praised the armed police and special police conducting rescue work, urging them to keep saving lives as top priority and to keep losses to a minimum. An aftershock occurred during his speech. "You should watch out and take good care of yourselves too," he told the rescue personnel. In a damaged aluminum factory, he asked relevant officials to draw up policies to support affected enterprises in resuming production. Some remote quake-hit areas were in urgent need of food, drinking water, tents and gasoline, Hu reminded the authorities. In Longmenshan Town, Pengzhou City, Hu told local officials that they should continue to race against time to rescue stranded people, and clear the debris to prepare for reconstruction. He also told medics to carefully conduct disease prevention in the wake of the disaster. The central authorities have vowed to take saving people's lives as the top priority in the rescue and disaster relief work. They urged rescuers to make "100 percent" efforts even if there is only "one percent" of hope in searching for and rescue survivors. 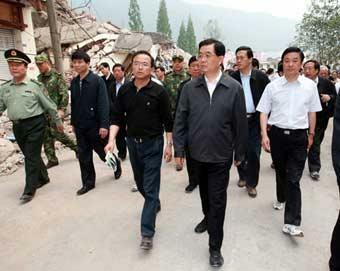 Premier Wen Jiabao said to quake-affected people during his visit to Muyu Town of Qingchuan County that "the (Communist) Party and the government would not forget quake-hit remote villages." "The focus of our work will gradually shift to rural areas hit by Monday's quake," said Guo Weimin, an official of the Information Office under the State Council. Searching and rescue efforts continued five days after the quake. Rescuers pulled five people alive from the earthquake debris in Sichuan Province on Saturday. The death toll from the quake had risen to 28,881 nationwide as of 2 p.m. Saturday, while 198,347 people were injured, according to the emergency response office of the State Council.